Born and raised in the city, but country kids at heart . . . . .
Judy, Jean and Kathy Howard grew up in southwest Portland, Oregon and lived very near to a wonderful facility by the name of Alpenrose Dairy. Alpenrose is a working dairy in the middle of town. Alpenrose Dairy, Inc., on Shattuck Road, stands as a reminder of quieter days. During the 1960's and 70's, the dairy maintained a herd of up to 100 Shetland Ponies. This is where Judy, Jean and Kathy gained their love for the Shetland Pony and invaluable experience in their equine knowledge. It is, too, where Judy, Jean and Kathy developed their philosophy in working with the public - treat each person met with dignity and respect. One Sunday afternoon, their parents took them to the dairy to see the animals. Some school friends were riding the ponies whose father was employed at the dairy to milk the cows. They invited Jean and Kathy to ride with them that day, and as they say, the rest is history. For 15 years, Jean and Kathy went to the dairy after school and on weekends to work with the Alpenrose ponies. 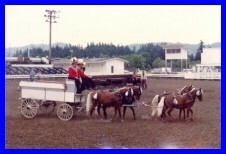 While at Alpenrose, Jean and Kathy participated in various parades - driving teams of Shetland Ponies which included the Portland Rose Festival Grand Floral Parade. Each year, Alpenrose would go to the Lloyd Center as part of Lloyd Center's anniversary celebration. 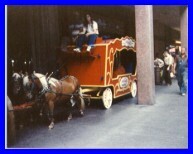 Jean and Kathy would help participate in driving the ponies in a circus parade through the mall. It was always the responsibility of Kathy to drive the 4-pony hitch on the calliope, which was quite the experience. Jean and Kathy also participated in the Alpenrose Americana Pageants that were held over the 4th of July - a story of American history. In the 1960's and 70's, Alpenrose sponsored the largest all Shetland Pony show in the country, the Alpenrose Shodeo. People traveled from as far away as Michigan to show at this event. It was at this show that Jean and Kathy exhibited their first Shetland Ponies. Through the years at Alpenrose, Jean and Kathy rode the ponies in timed gaming events, showed teams of 2 and 4 pony hitches (learned to drive 6 and 8 pony hitches). They even raced teams of ponies on chariots (Jean tried to find the picture of Kathy racing, but she thinks Kathy purposely has hid it). At the Shodeo, Jean and Kathy became familiar with the harness and roadster ponies and decided that is what they really wanted to do with the Shetland ponies. In 1979, Jean and Kathy purchased Rock-'n-Roll's Wow, a 43" sorrel roan Shetland Pony stallion - this was the beginning of Howard Stables. Jean and Kathy were able to board Wow at Alpenrose and continue to work with the Alpenrose Shetlands. Jean and Kathy showed Wow in the pleasure driving and halter divisions. 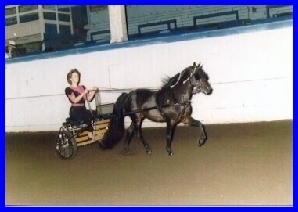 Alpenrose had a 46" bay Shetland Stallion that they took along with them to the local shows. His name was B. The Great Day, affectionately known as Barney. Judy, showed Barney and received many first place awards in the Pleasure Driving division. When Jean and Kathy moved to their current location in 1985, Barney came with them. After several years, Jean and Kathy purchased their first roadster pony - a little mare by the name of Crescent's Copper Misty. Their first harness pony was Silver Blazer, foaled in 1967, . All of their first show ponies were seasoned veterans that they were able to learn from before moving on to greater challenges. Kathy still shows her own Shetland and Hackney ponies. However, in 1990, she was approached by Scott Creek Farm to train one of their Miniature Horses to drive. She thought it would be fun to work with the smaller equines and has been training Miniature Horses, professionally, ever since. Kathy has met so many wonderful people across the country throughout the years and has many great memories of those early years as an "Alpenrose Pony Kid" and, more recently, as a public training stable competing, successfully, at the National level. All of these experiences have made Kathy who and what she is today.